Ah, Dingle. The gorgeous, oft-visited peninsula that so easily found its way into my heart. Dingle was so much more than the tourist-haven I expected, and with its beautiful music, people and nature, I’m dying to go back. Dingle is located on the far west stretches on Ireland, about as far as you can go before hitting America. I know Lonely Planet would scold me, but Dingle Town was utterly charming. Who couldn’t love a town with a pet dolphin named Fungie that lives in the harbor? I had been planning on spending my three days on the west coast visiting a few different places, but upon arriving to this cozy B&B I just knew I had to stay put. After napping away my first few hours in Dingle, I finally dragged myself out of bed to do some exploring. I’m not in a place with a name as great as Dingle everyday, you know. Wandering around I snapped away at the vistas that always charm me in Ireland: the wildflowers growing out of hedges, the greener than green grass, the cobblestone sidewalks. But there were some sites that were new to me like the harbor full of colorful boats. 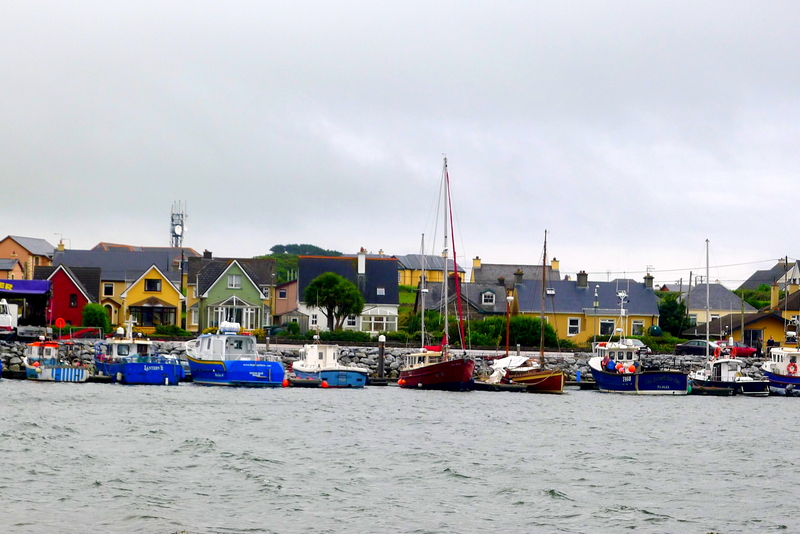 It turns out that long before Dingle was a tourist magnet it was a fishing town, which explains the fish chowder advertised on every menu in town. And then the magic stopped for a moment when I spotted the construction of a cinder block wall on the side of the road. All these years I totally thought the quaint, stone-hewn walls were real. But cinder blocks! You really pulled one over on me, Ireland. The magic was restored when I saw this promising sign. Around dinner time, I started chatting with a super friendly American family while standing outside of a pub. They invited me in and bought me a half-pint of Guinness, and then invited me to come along to dinner with them. As someone who not only frequently dines alone but dines on train-station sandwiches, I couldn’t believe my luck. We headed to Out of the Blue, a restaurant which 1,000 Places to See Before You Die rates as the best in town. To my delight, it was seafood-only. I dug into smoked Irish salmon and creamy fish chowder while gabbing away with my fellow Americans. Good wine, brown bread and golden Irish butter accompanied the conversation, naturally. After dinner we headed over to the town’s liveliest pub, The Courthouse. There was a girl singing in Irish whose voice made my eyes well up with tears. In fact she was so good that I even bought her CD, which means a lot considering how cheap of a traveler I am. Dingle is located in the Gaeltacht region, where Irish is still spoken, so that accounts for all of the cool Gaelic names. This was my post-pub breakfast the next morning. And I must ask you; is there anything better than an Irish breakfast when you’re a tad hungover? Have you ever visited Dingle, Ireland? Did you like its pubs as much as I did? There is definitely nothing better than an Irish breakfast when you’re hungover (except maybe a Scottish one – totty scones. Yum). Agreed! I have to say my favorite meal in both Scotland and Ireland is breakfast… so delicious and so much heartier than breakfasts on the continent! In Thailand a lot of the cheap restaurants that cater to tourists have, “British breakfast,” “American breakfast,” “Israeli breakfast,” “French breakfast” etc. and the British meal always looks sooo hearty compared to the rest! I guess that would make it the best hangover breakfast then :) It sounds a little much for me but I think I’d have to try it in the UK before writing it off from the Thai version. I never saw that one… next time! awwww you travel! neat! color me a bit jealous, but the only thing that makes up for not traveling is reading blogs that take you places like this one :) lovely post! I LOVED my time in Ireland, looks like you got a good dose of craic (SO Important) Good on ya for getting the CD. I would’ve done the same thing. I know, it’s so much fun to be here and yes, enjoy some “craic”, haha. I keep trying to figure out ways to go back!